I don’t know how it’s been where you live, but for us in New York City, it feels like we haven’t seen the sun for, oh – ten years? Every day for the past week it’s been overcast or rainy or snowy. It’s been damp, dank, dark. It’s like New York City has suddenly become Seattle without the Sky Needle. 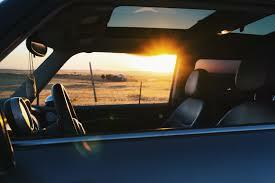 Sometimes I wish we could just reach up and push away the clouds – like opening the sunroof on our old Chevy Avalanche. The truck sits around at our cabin in Wisconsin, all closed up. So, the cab can become like our weather – dark, dank and musty. But then, you open the sunroof, and it completely transforms the environment. You look up through top of the cab and see the blue sky, breathe in the fresh air and feel the warmth and light of the sun streaming down. The bad news is that the weather doesn’t work that way; we can’t just push away the literal clouds in the sky like opening a giant sunroof. The good news? We can push away the clouds in our hearts. And the way we do it is through prayer. To me, prayer is like opening a sunroof. Every day we ride around in a dark, stale, musty environment of our own creating. It’s called life. And when our sunroof is closed, our world is limited, contained in its little box. It’s full of the clouds of self-doubt and fear. It’s a stale world, devoid of fresh air, warmth and light. But when we pray, it’s like opening the sunroof. We reach up, push away the clouds and open our hearts to the light and warmth and power that is waiting to stream in. I once read that prayer is like joining our “natural” abilities with God’s “supernatural” abilities. That’s the power we can access. And we can access it anytime. Caller: Is this the house of God? Brian (our church Administrator): Yes. Caller: Well, can I speak to God. Brian [long silence]: You don’t have to be in the house of God to speak to God. We all surrounded by light—from birth to death and past. A light that you can access anytime, anywhere. You never need to feel afraid. You never need to feel alone. All you have to do is push away the clouds and open the sunroof.